The audacious plan by a South African ex-pat businessman to save the white rhino has moved from a news curiosity to the brink of historic reality. This summer, Ray Dearlove’s project to relocate threatened wild South African rhinos to a safe breeding zone in Australia—and then repatriate them home when its safe—received a standing ovation from a major TED audience at the Sydney Opera House. His presentation on the successful progress of Australian Rhino Project followed the poaching of over 1,300 rhinos in 2015 and a 5% decline in the total population since 2010, due to an unabated demand for illegal rhino horn products in Southeast Asia. With three rhinos killed each day and the deaths-to-births tipping point now breached, new projections suggest that the southern white rhino could face extinction in the wild within 10 years. Meanwhile, the northern white rhino did become effectively extinct this year, with just a few female individuals now alive. Dearlove also generated gasps from the TED audience when he revealed that international crime syndicates themselves now fully anticipate that rhinos will become extinct from their own actions – and are hoarding horn to sell onto the market at even higher prices when rhinos are gone. 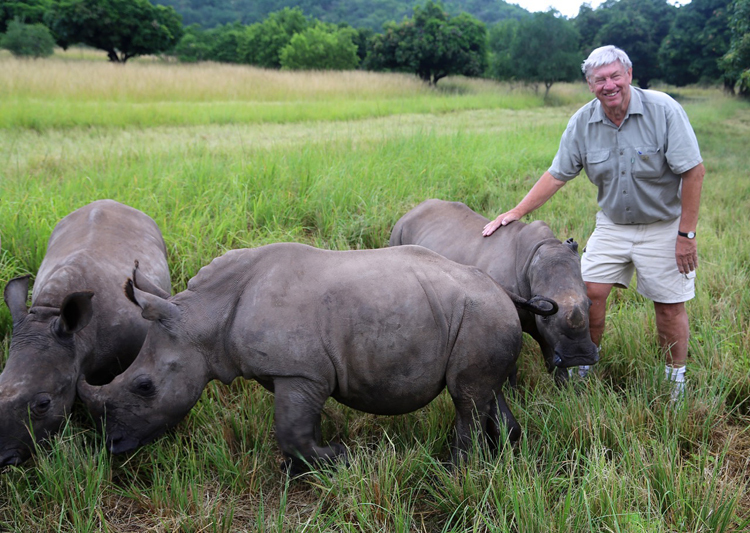 Like Doctor Ian Player –the man credited with saving the white rhino in the 1960s– Dearlove is an alumnus of St. Johns College in Johannesburg. Player was supportive of his friend’s maverick campaign. Dearlove –a former IT executive and rugby aficionado— told SABLE that the plan is to move 80 white rhinos from South Africa, over a four-year period, in order to enable a suitable wild space at the Western Plains Zoo. Once the sustainable breeding herd is formed, then they can repatriate at least that same number back to their wild habitat in Southern Africa once the extreme poaching threat has passed. He says the wild herd could reach about 400 by 2040. Having emigrated to New South Wales in 1987, Dearlove has served in senior sales management roles for major IT companies, while also serving as a rugby manager for teams including the Brumbies – where he served alongside legendary coach Jake White. After three years of planning and fund-raising, the Australian Rhino Project has not only achieved the required non-profit charity status, but also identified a source of rhinos; secured in-principle agreements in both countries; and developed an affordable relocation plan, at about $75,000 per animal. Experts say the project is well-positioned to earn CITES permissions, when that stage is reached. Government permissions – particularly on biosecurity assurance – remain the chief hurdle, while the project is also seeking an airline partner for the moves. “The Australian government is absolutely – and I mean absolutely - focused on the biosecurity in this country, and I understand that,” he says. (He reminded the TED audience that Johnny Depp discovered that fact to his cost, after trying to bring his dogs into the country). Dearlove says the Project has established sources of reproduction-able rhinos and orphans from private game owners in South Africa—many of whom are under siege from poachers, and forced to spend a fortune on security. By contrast, following a successful relocation, he sees significant eco-tourism benefits both for the host organization and society in Australia. Hopefully, the hoard of global travelers will literally reward all parties for their efforts with their tourism dollars. Most importantly, wild southern white rhinos would be assured of survival. Dearlove would gladly halt the project if any existing strategy to protect rhinos had a realistic chance of success. He says the most credible data models are clear that none of those initiatives –from legalizing rhino horn trade, to enhanced law enforcement, to internal relocations to “Intensive Protection Zones”– can prevent the higher deaths-to-births ratio, and the ultimate decimation of the species. The poachers are remarkably well funded and well organized. “The late great Ian Player was a wonderful supporter of this project; his belief always was to spread the risk. That is what we have to do again,” he says. Having spent most of my own reporting career in South Africa, I have had the privilege not only of experiencing half a dozen 5-day wilderness trails in the Mfolozi, but also of spending time with Ian Player. Despite his gruff demeanor, I remember how Player’s face shone when wondering aloud, for instance, why white rhino calves walk ahead of their mothers, and how they know where to go in leading. I remember coming upon three rhinos in Alicedale, in the Eastern Cape, and confidently telling the friends in my car that because they were white rhinos, they would not charge. Their prehistoric heads brought to mind grey sleeping bags filled with oblong concrete blocks –utterly angular and heavy– with a pair of horse ears stuck on top. Well, the car was a grey Alfa Romeo, which those rhinos apparently mistook for a rival rhino, and they proceeded to chase my rapidly reversing vehicle not only back down the road but also over some railway tracks and into a rangers’ compound, where we were trapped. It was a scary experience, but also awesome, and deeply humbling.